…[W]e can offer no solutions, no easy answers, to other people’s tragedies. We can only be there. It is Jesus they need, not us, and even he offers no answers. He offers himself. It is when people find their way through to him that the pain of their life becomes the pain not of death, but of birth. A thing of hope. That is so true. So often, there is nothing to say to ease someone’s pain. Simply being there, and loving them like Jesus, and pointing them to Him and to His love and His comfort is enough, and better than trying to say something. After reading, “Through Gates of Splendor”, and “The Savage My Kinsman”, I took up this book for more of the same. I was not disappointed. This book was filled with excerpts from Jim Elliot’s journals, and interspersed with Elisabeth’s commentary and additional information that put the entries in some context. This book moved slower then the previous two, but was absolutely worth the read. This book was powerfully inspiring and motivating. The journal quotes breathed such love and fervent, passionate devotion to God. His preoccupation with the things of God, the way he viewed all of his life as a sacrifice for the service of Christ, helped reveal to me the areas of my life in which I still viewed my life as “my own”. Reading this book stirred a lingering desire in me to be a missionary and share the gospel with those who have never heard, as it laid bare how empty this life is if not devoted to things that matter in eternity. Although his passion was extraordinary, at least when compared with the majority of Christians today, he did have times of discouragement and despair. He was not without his weaknesses, yet he did not let those times or temptations dissuade him from seeking his treasure–Jesus Christ. Jim Elliot was encouraged by friend and family to remain in the states to stir up the American Christians. He did not, saying that Americans had the Scriptures, and he could not stay while there were other peoples that had never heard, and didn’t have the Scriptures. I find it a marvelous working of God that in following his calling to go to Ecuador, Jim Elliot did both–was a witness in an unreached people group, and yet, also stirred up, and continues to stir the American Christians who hear his story, and read his story–a life lived passionately for God. Have you ever been absolutely inspired by the gospel? Ever felt in awe at it, at the very thought of it? I’ve been reading such wonderful, edifying books lately: The Hiding Place by Corrie Ten Boom, God’s Smuggler by Brother Andrew, and Through Gates of Splendor and The Savage My Kinsman by Elisabeth Elliot. In each one, I was overcome with the love these people had for the Father. They were truly willing to give all; to spend and be spent in His service that others might know and be reconciled to God. Through Gates of Splendor impacted me the most. Jim Elliot’s expressions of devotion were so moving, and deepened my hunger for a close, intimate relationship with my Savior. 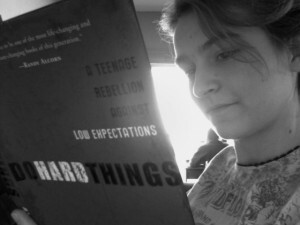 Yes, I am late in recommending Brett and Alex’s new book, Do Hard Things, but better late than never, right? You need to hop right over to theRebelution.com and take a look at it, then continue on to Amazon.com and place an order (for two copies, ideally!). In one instance, I’m reading from a book, and another time I’m reading on a computer screen. (Here’s a grammar question: do you read from, or on a computer screen?) These days I find myself reading on the computer more than from paper books. I greatly appreciate the variety of material available, and the ease of taking my laptop with me, and with it, a multitude of reading material (more than I could carry with me in paper!). I’ve noticed, though—rather to my dismay—that I tend to read too fast when I’m reading on my computer, especially when I’m reading through blog posts in Google Reader. I tend to “skim” more than actually reading, and then realize what I’m doing and slow myself down. For some reason I seem to associate “computer” or “online” with “speed”. Maybe this isn’t an issue—maybe I’m saving myself time? It just seems like a waste of time to skim something and not remember very much from it. I’m seriously thinking about cutting back on Google Reader. Maybe limit myself to five blogs at a time, and rotate which blogs I follow? Do any of you read faster on-screen than you do when reading from a book?